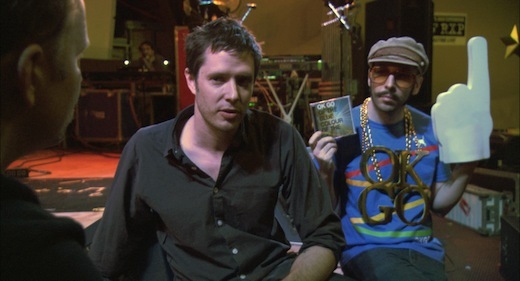 We are pleased to announce the brand new OK Go single, “The Greatest Song I Ever Heard.” It’s the theme song for the new Morgan “Super Size Me” Spurlock movie, POM Wonderful Presents: The Greatest Movie Ever Sold and we think you’re gonna love it. The song is available right here on our website, as well as on iTunes, Amazon, and most likely from your favorite online retailer as well. As an added bonus we’re offering Damian’s short but sweet sketch of a song “Love Me Longtime” as the B-Side of the single as an instant, free download, exclusively on this site. The track debuted on the April Fools Day edition of NPR’s All Things Considered and you can hear the whole story here. So, pre-order “The Greatest Song I Ever Heard,” and get “Love Me Longtime” immediately. Simple as that. Oh and of course you can hear the song in the film itself. Which you should do, especially because Damian and Tim are in it. Briefly. But, still. It comes out in select cities on April 22nd. So grab your sleeping bag now and head to the parking lot of your nearest cinema to be the first in line!